Espoo, Finland - Nokia today announced the Nokia Asha 310, a new Dual SIM smartphone with Wi-Fi support to help people get more out of the Internet, for less. Nokia's Asha 310 is a dual-SIM featurephone with Wi-Fi running the Series 40 Asha Touch UI on a 3-inch capacitive touchscreen with a WQVGA resolution. Affordable Nokia Asha 210 with QWERTY keyboard : Nokia unveiled a new phone in its Asha family, designed to offer consumers more social experiences at an affordable price. 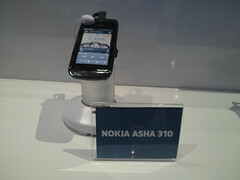 Nokia Asha 310 phone. Announced 2013, February. Features 3.0″ TFT capacitive touchscreen, 2 MP camera, Wi-Fi, Bluetooth. The world is waiting. Dive in with super-fast browsing and social media, slick touch screen and data tracking. Do more, pay less with the Nokia Asha 310.